VERSAILLES — Jack D. LeTourneau. It’s a name not known in Versailles, but it’s one Alexa Didier will never forget. 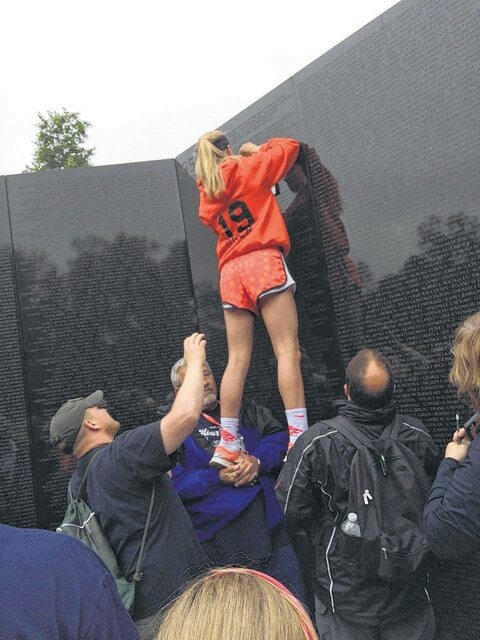 Alexa and her fellow eighth-graders from Versailles Middle School were in Washington, D.C., for the school’s annual trip to the nation’s capital from May 31 to June 4. On their second to last day there, June 3, the group made their way to the Vietnam Veterans Memorial. The Vietnam veteran was looking for a way to get a rubbing of the name of a fallen brother — U.S. Air Force 1st Lt. Jack D. LeTourneau, who was killed in the Lam Dong Province in South Vietnam in February 1962. He was 28 when he gave his life for his country. He was a member of the 1st Air Commando Squadron, 314th Air Division, 13th AF. His name is forever etched in the Vietnam Wall on Panel 1E, Line 6. The name is on one of the two tallest panels of the memorial — where the two walls meet in the middle. Too tall for the veteran to do the rubbing himself. And that’s where Alexa does something that will remain with her forever — she reached out and thanked a veteran for his service by fulfilling his wish, a rubbing of LeTourneau’s name. The Versailles students, the veteran, his wife and others made their way down to the center of the wall. There, other people were trying to figure out a way to get the rubbing. When they learned Alexa had volunteered to be lifted up, three men volunteered to help her. With two men holding her feet, and a third holding a hand up behind her as a spotter, Alexa was lifted to the top of the wall. There she made the rubbing of a name of a man who is an American hero. “I didn’t really feel anything when I was being lifted up,” said Alexa. “But when I handed him the name, it got very emotional. His wife said to the vet that they were going to keep it in a place for safekeeping. He started crying and then she started crying. Then they started hugging,” she said. Her classmates told her she had done an amazing thing. “They said it was ‘amazing and very nice of you,’” Alexa said. Back in Ohio, Alexa’s mom, Kara, had wanted to go to D.C. with her daughter. Her husband, Doug, had gone on the trip with the couple’s older child four years ago. But Kara, who had a double-lung transplant three years ago, knew she couldn’t handle the pace of the trip. Many people took photos of Alexa near the top of the wall. Janell Whittaker sent one back to Ohio to Kara’s cell phone. There are two photos of Alexa on Facebook doing the rubbing. At press time, one of the photos had 6,158 shares. Another photo had more than 700 likes. And that moment of helping a veteran will remain etched in Alexa’s mind forever. And for the Vietnam veteran, the small act of generosity performed by a young girl from Ohio shows that America will not forget men such as 1st Lt. Jack D. LeTourneau, who was killed in the line of duty in Vietnam.